Lia’s new growing area is up and running, but will her greenhouse be ready in time? It is all change down at the greenhouse this month. 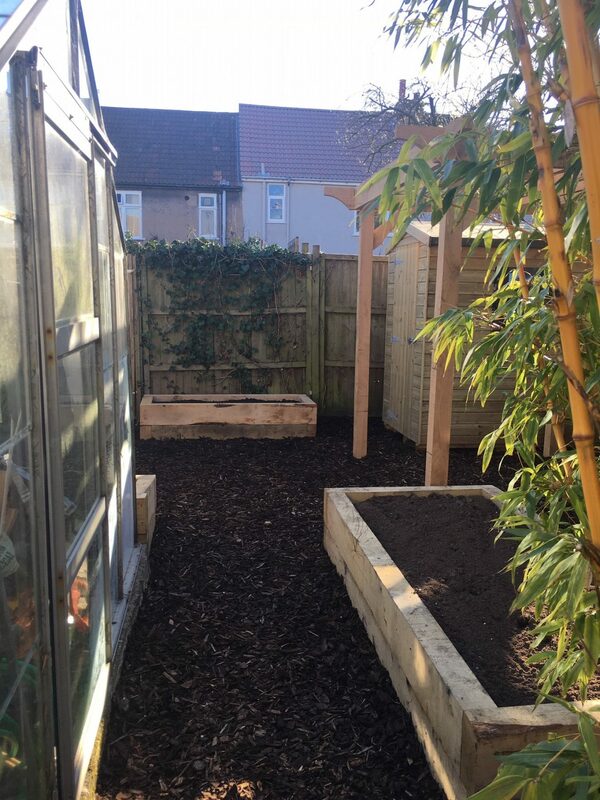 I wrote here a couple of months ago about the changes at the bottom of the garden, in essence: we gave up the allotment, pulled down the massive shed at the bottom of the garden, and have built raised beds to grow things in. While all this was going on though, the greenhouse gradually filled up with all of the things that were once in the shed. Now we find ourselves at this crucial moment in the greenhouse year and the greenhouse is full of half-used paint pots, and old rabbit hutch, three sledges and plenty else. All of this is bound for the brand new shed which has gone up as part of the garden-end makeover, but it isn’t there yet. In the meantime we are having to make do with windowsills and the little greenhouse, which is fine while we’re dealing with seeds and little seedlings, but will become very problematic as these seedlings grow into needy plants: better get our skates on (or our sledges…). But my concern right now is to get tomatoes sown. Most plants I am not too worried about as our late start can be glossed over with a few plug plants from the garden centre, but these tend to be cherry and medium sized tomatoes – there will be no end of Sungold in the garden centre, not that that is a bad thing because I love those sweet, yellow little bombs of flavour, but my true loves are the beefsteaks, big, fat and dripping with juice, sliced and laid on a plate while still warm from the sun and then doused with extra virgin olive oil and a sprinkling of salt. I could live on this in late summer. My preference, however, is no so well catered for in the garden centres yet and so so we will have to sow. I must have ‘Couer de Boeuf’ and ‘Marmande’ both of which I fell for when visiting an Italian allotment in Coventry at harvest time some year ago. The allotment holder had a polytunnel filled with them and nothing else, gloriously deep red and shining, you could eat them like (huge) apples. They looked way too big for the plants that were supporting them but were left for days and days after turning red, so that the flavours and sweetness would develop. This is the dream, and so I have grown them almost every year since. I have never quite managed them en masse like this, and this year I am cut down from a full polytunnel to a fairly small greenhouse, and so am even more strapped for space but never mind, at least one plant of each and I will be happy, and have at least a few of those tomato lunch. And so they have gone into the heated propagator this week. The work on the vegetable growing area at the bottom of the garden will be finished this week, and then we need to swing into action. The first task is to throw away most of the stuff in the greenhouse – who really needs a spare rabbit hutch anyway? – and then to put what is left into the shed in an orderly fashion. Then there will need to be a big scrub down of the greenhouse, plus at least three of the panes of glass need replacing. It’s been a bit of a marathon I don’t mind admitting. We are still a way off, but are edging ever closer. Let’s hope we get there before the tomatoes decide it’s time.